I remember reading somewhere that the measure of one's character could be determined in the execution of a punch or kick. That sounds like a bit of a stretch, although early Chinese thought implies a correlation between chi and morality. At any rate, a certain amount of wisdom is expected to be developed alongside of one's advancement in their art. Dan denotes a black belt rank, but another definition suggests a coming of age, not only chronologically, but in maturation. Children hold black belts, but they are not yudansha nor should they be regarded as such. Most schools will actually retest young black belts for shodan when they arrive at a certain age, usually 16. In his book Nature and the Human Soul, Bill Plotkin describes a social ill that he calls patho-adolescence: adults - especially those in a position of authority and power - who possess the mental and emotional acuity of teenagers. Think of certain political figures that have headlined the news recently. Are there any sensei or black belts that you've come across that could be labeled as immature? The consummate martial artist should have a developed sense of responsibilty and self-control. One instructor I knew told me that he doesn't spar with his students out of fear of killing someone. I suggested a career in Special Forces. He didn't get it. When I speak of maturity in the martial arts, it's not stoical indifference to joy or grief - believe me, there's plenty of both to be found in the dojo - but rather integrating wholeness within the range of human emotions. Some high ranking instructors that I've met mix a good deal of humor into their lessons. "Sometimes you have to entertain your students" a colleague of mine once said. It's good to lighten up once in a while. Being childlike is not the same as being childish. These are all really good points/observations. It's so true what you say and one can definitely tell a black belt who gets it and possesses the right qualities from the ones who don't. I Googled that book and am going to get my hot little hands on it. I've been spending way too much time on work and/or training. A little recreational reading is in order. This one sounds right up my alley! I may review it on my blog when I'm done. ...one can definitely tell a black belt who gets it and possesses the right qualities from the ones who don't. You really need some of the ones with the "right qualities" to make that comparison. Otherwise not-right will appear normal. In the meantime I linked the title to Amazon.com. I should've done that in the first place. Enjoy that book, it's a good one. I'm pretty lucky to have a good school and mature people to train with. The age average has something to do with it, for sure. Is it just me or all the personal growth I get from my training, I got on my own? In fact, I can say that I would not rely on karate training to get to another place, maturity wise. The best training I got is at home. On many aspects. This is not to put down my sensei. He's the best I've ever had. I still rely on myself to get better, no matter the sensei. I still rely on myself to get better, no matter the sensei. I hear that. In the end, we only have ourselves to fall back onto. Just ordered a used copy! Excellent! Looking forward to your review. I quoted you in my blog. Thank you for your insights. Thank you, FTTS. Welcome to my site. I agree totally with all that you have said on this posting. Formation of one's character into a more mature, responsible, self controled, and respectful person is the main goal of Karate ( in my opinion) learning how to defend oneself is a bonus. Also, the perfection of one's character doesn't end when a person reaches a level such as black belt, I believe that it is an ongoing struggle until one's dying breath to accentuate the positives, and diminish the negatives in our personalities. Our limbs may lose flexibility, and strength with age, which makes it all the more important to train our minds to become more flexible, focused, and alert. I believe that it is a sad thing that so many modern Martial arts clubs focus on gaining belt ranks, and tournament medals over forming the inner character of their students. The lessons that build character will help that person to be a happier, healthier, and safer human being in the future. Formation of one's character into a more mature, responsible, self controled, and respectful person is the main goal of Karate ( in my opinion) learning how to defend oneself is a bonus. This is what Gichin Funakoshi espoused. 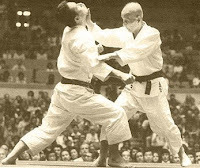 Donn Draeger also said actual combat effectivenes was but a "by-product"; that, again, character-building should be held as the highest priority in the martial arts. And I totally agree that rank and such can be an obstacle if they're taken out of proper context and understanding. "Life is not for martial arts, martial arts is for life."